Today's, and every day's, words to live by. Since starting this blog (and certainly since moving to NYC) I've watched my sense of style and fashion grow, particularly my confidence to wear things I would have felt were "too dressy" or "too mis-matched" or a multitude of other monikers. I've never been one to shy away from color and certainly own more azure blue than black, neons than whites, but I played it safe with t-shirts and jeans and simple shoes. Lately, I've been kicking it up another notch, as you'll see in some of my style posts over the next few weeks! 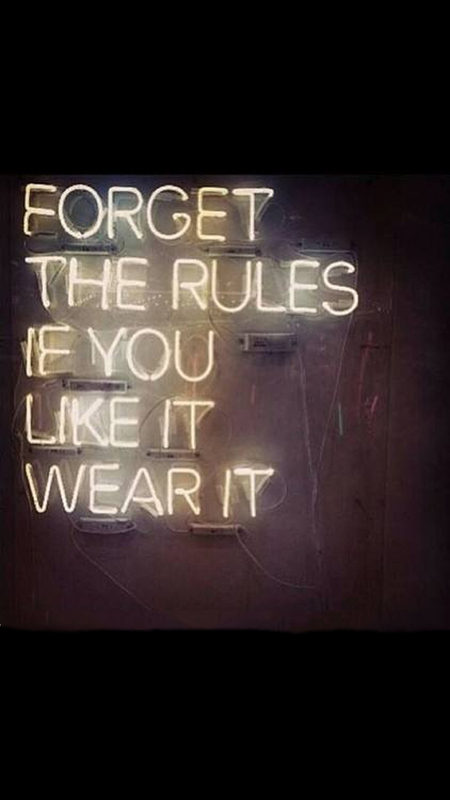 So, forget the rules-if you like it, wear it. Unless it's a semi-sheer top like I have on today and you're going to work and have meetings with your boss, then you should probably still wear a camisole underneath.